Note: Note that a Guardian license is required to view the search term logs. For more information, contact your Smoothwall representative. The Search terms log records the search terms and phrases used by users, and the search engine used. To view the Search terms log, go to Reports > Logs > Search terms. 1. On the Reports > Logs > Search terms page, click Realtime. The Smoothwall displays the currently configured log options in real-time in a table of log entries and in the web filter graph. The results are updated automatically. 1. Go to Reports > Logs > Search terms. • Username — Select to display the username of the user who made the request. • Search phrase — The search term or phrase that was used. • Category — Select to display the categories a request was categorized as being in. • Username — Enter a username to view only their search terms used. • Source IP — Enter an originating IP address to view search terms used from that address. Click the down arrow and select Exact match to only search for the IP address specified. You can also enter a subnet range to search for, for example, 192.168.0.1/24. 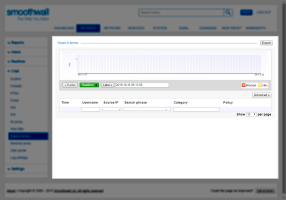 • Search domain — Enter the domain name of a search engine to find all searches that used it. Note that this is the URL of the domain, not the search engine name. • Search phrase — Enter a search term or phrase to view all web requests that used those searches. Search engines, such as Google, make use of predictive search suggestions. For example, a search phrase of "football clubs" may inflate the Search terms log by having entries of "f", "fo", "foo", "foot", and so on, for built up searches. Click the down arrow and select Exclude search suggestions to remove them from the log viewer's results. • Category — Enter a category to view all search terms requests that were categorized as belonging to. It is possible to export log data in comma-separated (CSV) format. 2. Select and filter the log data you want export. For more information, see Viewing Search Term Logs and Filtering the Search Terms Log. 3. Click Export at the top of the screen. Follow your browser’s prompts to save and export the data.